Tyler Wilson has always been connected to the ocean. The Pacific was his backyard growing up in Campbell River on Vancouver Island. But it wasn’t until he completed a minor in ocean science at the University of Victoria that the ocean became central to his future. 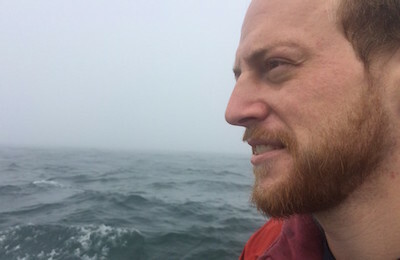 When the School for Resource and Environmental Studies (SRES) posted a call for a master’s student to investigate the socio-economic impacts of ocean acidification with Professor Peter Tyedmers, it seemed like the perfect opportunity. As Tyler says: “It was a topic I was very interested in learning more about, and I had already determined that Halifax would be a great place to live.” Tyler was chosen and began the Master of Environmental Studies (MES) program in September 2015 and quickly found SRES to be “a really welcoming and productive working environment and community”. Tyler assumed his strong understanding of fisheries on the West Coast would translate well: he grew up in a fishing town with family members working in the commercial fishery and worked in the field himself after his undergraduate studies. He ended up being surprised by how differently the two industries are managed and cites learning about the East Coast fishery as one of his favourite aspects of the project. Recruiting Dr. Sarah Cooley (Director, Ocean Acidification Program, Ocean Conservancy, Washington, DC) and researchers from University of British Columbia to his research committee helped fill the knowledge gaps. Many of our crucial natural resources are in danger, including our oceans. As Tyler’s thesis states, ocean acidification is a consequence of human activity. This kind of research is more important than ever. With the establishment of world-class partnerships such as the Ocean Frontier Institute (OFI) and an influx of funding, Dalhousie is becoming a leader in the struggle to save our oceans. Departments from across the university, such as SRES, and passionate students like Tyler are key to the fight. Tyler graduated with his MES degree in May and continues to use his data acquisition and analysis skills, most recently as a technician with the Salmon Genetics Unit of Fisheries and Oceans Canada. He is also working on polishing the results of his thesis research for peer-reviewed publication.